You’ve asked a good question. If your date of retirement is, for example, 9/1/16, in most cases (assuming you work full time, and assuming your last years of employment are your highest years of earnings), your FAS would go back starting from the day before your retirement date; so from 8/31/16 back to 9/1/15, and then from 8/31/15 to 9/1/14, and so on. Excellent information that most are not aware of. Does NYSLRS know how much people get paid on a daily basis in order to make these calculations? Is reported salary information done on a daily basis? Most here thought it was on a monthly basis. Employers do report members’ earnings to NYSLRS. How frequently depends on the employer. It’s often a monthly report, but it can also be weekly, biweekly, bimonthly, etc. Your final average salary (FAS) is based on salary reported to us by your employer. Your employer reports your gross earnings to us, before any deductions for health insurance. Your health insurance premiums would not affect your FAS calculation. On the OSC website it says that “payment for unused vacation, not to exceed 30 days, may be included in your FAS if the payment was made in the period used for the FAS”. But in other publications it says only if the FAS is included in the 36 months preceding retirement. Can you please clarify this? Both of those statements are true. Your Final Average Salary (FAS) is based on the highest average of wages earned during any three consecutive years (five years for Tier 6). Lump sum vacation is paid at the end, and is added into your FAS if your last three years are your highest. But if your FAS was the highest, for example, 10 years prior to your retirement date, your lump sum vacation would not be used because your lump sum vacation will still be paid out at the end when you leave public employment. Your benefit would be based on the higher FAS of $62,000, but in this case, your lump sum vacation would not be included. Please note that your FAS calculation depends on your tier and retirement plan. For more information, please read our Final Average Salary (FAS) page. It will show you how FAS is calculated for ERS and PFRS members in each of the different tiers. Then perhaps all brochures and handouts should clearly state as follows: “payment for unused vacation, not to exceed 30 days, will be included in your FAS only if the FAS is comprised of the 36 months preceding retirement”. Much simpler and clearer. How does special payments such as deficit reduction program and deficit reduction program payback and lumpsum union contract settlements affect final average salary? Your pension is based, in part, on your service credit and Final Average Salary (FAS). FAS is the average of a member’s three (five for Tier 6) highest consecutive years of earnings, subject to limitations. These are usually your last years of employment prior to retirement. When you apply for retirement and NYSLRS calculates your FAS, retroactive payments will be applied to the pay periods when they were earned rather than when they were paid. In general, union contract retroactive payments will increase your FAS as long as the time period in which you earned that money is part of your FAS. Deficit reduction plans that span several years have little or no effect on pension benefit calculations. Your FAS would not be reduced, because when you are eventually repaid the reduction money, we apply it back to where you earned it. If you have specific questions regarding your account, please email our customer service representatives using our secure email form, and one of our representatives can review your account to address your questions. Filling out the secure form allows us to safely contact you about your personal account information. Please allow five to seven business days for a response. You can also visit our Deficit Reduction Plans and Your Pension page, which is a good model for how we process retroactive payments in general. I retired March 28th 2016 here it is 8 – 9 months later and I still have not received my finalized letter. I am owed credit for 1500 hrs sick leave 148.5 hrs vacation. how does it take to make a simple calculation and pension change. Sorry but its getting a little frustrating. PS the phones still don’t work as the should. We apologize for the trouble you’re having getting through to the Call Center. Because of the many variables that are often involved in verifying service and salary details with your former employer, finalizing your retirement benefit amount can take some time. The average processing time can vary depending on how many incoming requests we’ve received and the complexity of your own circumstances. If you would like personalized information about the processing of your application and final benefit, please email us using our secure email form. Filling out the secure form allows members to safely provide us with the information needed for us to assist you. Please allow five to seven business days for a response. CAN OUR F A S TAKE UP TO A YEAR TO GET PROCESS??? THANKS!!!!!!! When a member retires, we need to verify service and salary details with the former employer. This can sometimes be a lengthy process, however, in the meantime, eligible retirees receive partial payments, which are usually 90-95% of what the final calculated monthly amount will be. Once we complete a benefit calculation and establish the retiree’s final monthly pension amount, the retiree will receive a retroactive payment for the difference between the partial payments and the final monthly amount. I have been working full-time for many years. If I work at 50% of full-time for 12 months before I retire, will that last year count as 1/2 of one of the three years used to calculate my final average salary? Your Final Average Salary (FAS) is based on a consecutive set of years where your earnings were the highest. (The period of time used is based on your tier. Please visit our Final Average Salary page for more information.) For Tier 1 – 5 members, it is the highest three full years’ worth of earnings. If you plan on working at 50% of full-time for the last year before you retire, and your earnings are highest right before you retire, we would need to look back at 3.5 years’ worth of your earnings in order to equal three full-time years. For a tier 4 member who was full time 7 years ago and is now part time (for the past 7 years) can they use they use their FSA back when they were full time? It depends on which time period resulted in the highest earnings. If you have been working part-time for the last 7 years before you retire, and your earnings are highest right before you retire, we would look at earnings far enough back to equal three full-time years (for example, six half-time years equals three full-time years). If the time before you started working part-time is where your earnings were highest, we would look at that time instead. Is geographical pay considered when computing final average salary? To get the details for your specific tier and retirement plan, please email our customer service representatives using our secure email form (see link below). One of our representatives will review your account to address your question. Filling out the secure form allows us to safely contact you about your personal account information. Please allow five to seven business days for a response. I expect to retire sept 2017. Last year I took 5 pay periods with 30% vrws. Does this affect service credit for that year? would last year be considered in the last year salary for leave credit? Benefit plan calculations can vary by tier and retirement plan. To get the account-specific information you need, please email our customer service representatives using our secure email form (http://www.emailNYSLRS.com). One of our representatives will review your account and address your questions. Filling out the secure form allows us to safely contact you about your personal account information. Please allow five to seven business days for a response. If you cannot deviate more than ten percent from the previous year when calculating your FAS, does that percent and subsequent dollar amount continue to compound annually? Or does it base specifically off the calendar year prior? Hypothetically income from Year 1 was 56,000, then year 2 91,000, Year 3 86,000. In a drastic inflation of income, how does that impact? ·	For Tiers 3, 4 and 5, the earnings in any one year can’t exceed the average earnings of the previous two years by more than 10 percent. ·	For Tier 6, the earnings in any one year can’t exceed the average earnings of the previous four years by more than 10 percent. In either case, we calculate each year’s allowed earnings independently; one year’s allowed earnings don’t affect the next. Check out our Final Average Salary page for specific examples of FAS and allowed earnings calculations by tier. For account-specific information, you can email our customer service representatives using our secure email form. One of our representatives will review your account and get back to you. Filling out the secure form allows us to safely contact you about your personal account information. Please allow five to seven business days for a response. When calculating your FAS. Do you include 3 years of Longevity payments or just one year of Longevity payments when calculating you FAS? 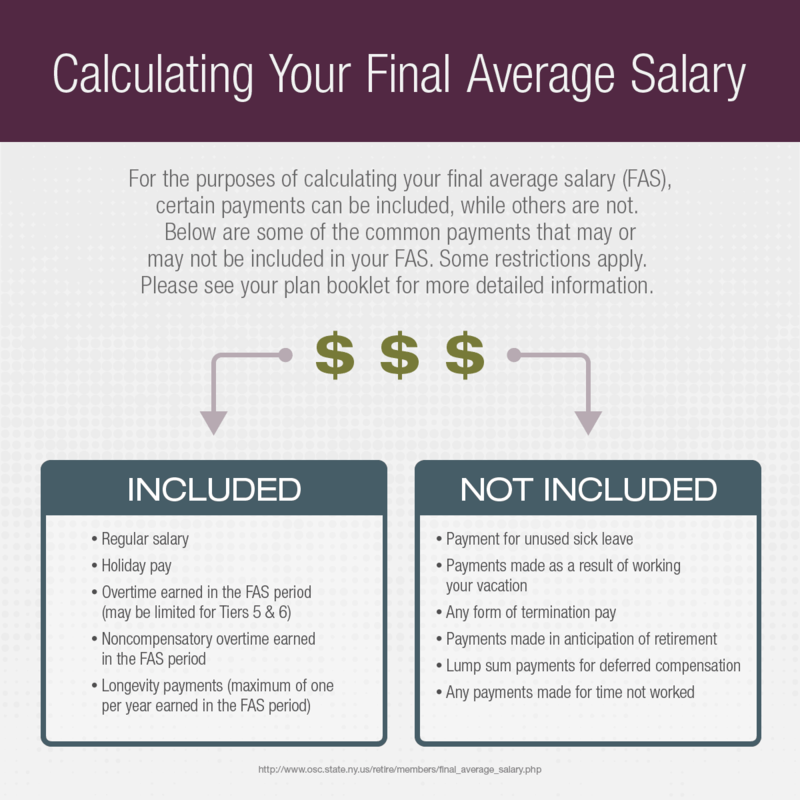 Your final average salary (FAS) is based on all reportable earnings within the calculation period, including some lump-sums such as longevity payments. If you have a three-year FAS, any longevity payments (not to exceed one per year of your FAS) earned in that three-year window will be included in your FAS. For more information, check out our Final Average Salary page. You can also find information specific to your retirement plan on our Publications page. For account-specific information, you can email our customer service representatives using our secure email form. One of our representatives will review your account and address your questions. Filling out the secure form allows us to safely contact you about your personal account information. Please allow five to seven business days for a response. It really isn’t 3 years is it? For example I changed jobs 2.5 years ago with a 40% increase in pay. The way the system is set up only 10% above the year before gets calculated into my FAS. So won’t it actually take 5 years for my pension to be credited with the full amount of the higher salary? Is Lag pay included in FAS? Doe the location pay allotted on my check count in my FAS? If location pay is part of your regular earnings, then probably yes. However, exclusions and limits may still apply and vary by tier and retirement plan. Check out your retirement plan booklet on our Publications page for details. If you have questions about your specific situation, we recommend emailing our customer service representatives through our secure email form, which allows us to safely contact you about your personal account information. One of our representatives will review your account and get back to you. Please allow five to seven business days for a response. I sustained permanent injury on the job and I only worked 7.5 years and retired 02/27/2017. How would my FAS be calculated? For information about your specific retirement benefit, we suggest emailing our customer service representatives using our secure email form. One of our representatives will review your account to address your questions. Filling out the secure form allows us to safely contact you about your personal account information. Please allow five to seven business days for a response. We are releasing Retirement Online in phases. Previous salary information is not available in the current version; we apologize for the inconvenience. Over time, we’ll be introducing additional features that will allow you to check past earnings, estimate your pension benefit, purchase service credit and more. In the meantime, you can see your previous salary information in your Member Annual Statement, which we distribute each summer. If you don’t have yours available, you can request a reprint by emailing our customer service representatives using our secure email form. I received severance pay in May of 2015 when I was laid off. I was able to get another job soon after. On my annual statement, that severance payment increased my reported salary for that year. Will that be included in my FAS? Thanks. The NYSLRS social media team doesn’t have access to your retirement account information, but we can give you some general information that may be helpful. 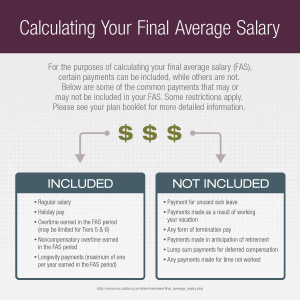 In most cases, your FAS only includes regular compensation earned during your FAS period. So, any form of termination pay is usually excluded. For more details about what is and isn’t included in your final average salary, check the FAS section of your plan booklet, which is available on our Publications page. For account-specific information, we suggest you email our customer service representatives using our secure email form. One of our representatives will review your account and respond to your questions. Filling out the secure form allows us to safely contact you about your personal account information. I want to retire in one year and currently have a balance of 80 hrs of holiday on the books. I would like this 80 hrs of holiday included in my FAS. IF I can use this 80hrs of holiday time for FAS, how do I do that? Depending on your retirement plan and tier, your FAS may include holiday pay or payments you receive for unused vacation time. For account-specific questions about your FAS, please email our customer service representatives using our secure email form. One of our representatives will review your account and respond to your questions. Filling out the secure form allows us to safely contact you about your personal account information. If I am vested in Tier 2 Police and Fire and I transfer departments is my FAS based on my over all 20 years or does it restart with the new department. For example I go from a high paying department to a lower paying department? For Tier 2 PFRS members, your final average salary (FAS) is usually based on your highest three consecutive years of earnings. These most often come right before retirement, but we’ll calculate your FAS with your highest consecutive years of earnings — whenever in your career they occur. For information about your particular situation, please email our customer service representatives using our secure email form. One of our representatives will review your account and respond to your questions. Filling out the secure form allows us to safely contact you about your personal account information.